The Our Lady Queen of Peace Parish has served the Catholics of Madison, Wisconsin’s, west side since 1945. Growing steadily through the years, QP has a rich history and is the largest parish in the Madison area. We continue to grow disciples through worship and prayer, learning and understanding, sharing and teaching, and serving our community. We invite our parishioners and guests to visit us during one of our Mass times. 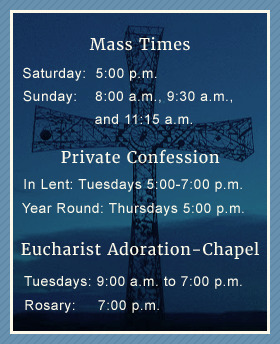 We offer Mass twice every weekday and Saturdays as well as three times each Sunday. Because some of our parishioners cannot attend Mass, volunteers take worship to their home. The Ministers of Holy Communion take this sacrament to sick and home-bound parishioners each Sunday. Faith is a journey. Along the road, we can benefit greatly by taking advantage of opportunities QP offers to learn and understand our Catholic Faith more fully. These include religious education programs. QP School provides a strong, faith-based education to K4 through eighth grade students. We emphasize rigorous academics in a faith-centered environment, many enrichment opportunities, and serving others. Students stay active in the QP community after graduation, participating in youth ministry and preparing for Confirmation. Service to community permeates Queen of Peace Parish, whether helping members of our parish family or those in need outside our church community. From adults to all ages of children, opportunities to serve are taken and experienced in church, choirs, the homes, apartments, and hospital or care center rooms of parishioners, in religious education and enrichment from age 3-103, in QP School and in Vacation Bible School. Outside the parish, opportunities exist with Midvale School; the Catholic Multicultural Center; St. Vincent de Paul; Grace Homeless Shelter; Luke House; Allied Partners; the Road Home; the Food Pantry Gardens; our sister parish in Chiapas, Mexico; Indian reservations in South Dakota and Montana; and many others. We hope you will find your way to what feeds your soul and serves those in need. Let QP know how you're interested in volunteering.